I served this country in uniform abroad, deployed on a ship as the sole physician for an 8 month and a 3 month deployment. I serve America as an individual every time I volunteer, help somebody, follow the laws, and try to be a good citizen. I know the words of the National Anthem. When played, I face the flag, come to attention, remove my hat, stay silent, and sing quietly. When it is finished, I sit down. Rote pledging and rote singing lessens value: I’ve seen shabby treatment of the Pledge by both students and teachers in schools. Every time I hear the national anthem, I am distracted by someone on a cell phone, people walking by me to find their seat, the guy in front of me with his hat on, or my neighbors chatting. I don’t know if they are Republicans or Democrats. They are likely both…and rude. Before the national anthem, I find the nearest flag. Then, when the music starts, I look at the top star on the left, Delaware, the first state, where I grew up. I look at the thirteen stripes, remembering 13 colonies winning independence against heavy odds, we fought the bloodiest war in our history to keep the Union intact from those who fought to divide us, what has happened so often in Europe. The Union is our strength, even the parts I don’t like, parts that are now patriotic, but fought us 150 years ago under another flag. I look at the red stripes, meaning courage. I remember the Americans who died at Bunker Hill, Belleau Wood, Corregidor, Midway, Guadalcanal, Chosin Reservoir, in the skies over Europe, Okinawa, Da Nang, Hue, Fallujah, or Kabul; every one of these places should be known by every American, regardless of how necessary the conflict was. “I have not yet begun to fight;” “Retreat? Hell no, we just got here;” and “Nuts” should be taught in the schools. I bet kids would enjoy learning where they came from. The white stands for honor and purity: the Marshall Plan, counting our dead. The Flag and Pledge deserve respect, regardless of one’s feelings. So does the office an elected official holds. One may dislike the holder, but the office deserves respect. I disliked the senators in the state where I once lived, but I dressed appropriately and was polite if I went to their offices to complain. Disagreeing with the Pledge, Flag, or Anthem is a right; that is what America is about. So is respect and honor. The blue stands for justice, the most difficult of the three, which is why I emphasize the word when I recite the Pledge. If I don’t like a law, I work to change it, not willfully violate it. We are a REPUBLIC, not a free-for-all, pick and choose society. The flag should be flown in fair weather, unless designed for inclement weather use. The flag should not be used as part of a costume or athletic uniform, except that a flag patch may be used on the uniform of military personnel, firemen, or policemen. Sports teams may have individuals of their sponsors contribute to any number of veterans organizations or the USO (my words). In 2005, I was one of 300 correcting AP Statistics Papers in Lincoln. At one meeting, all the veterans in the audience were asked to stand. I was pleasantly honored, but there weren’t many of us. Maybe this is how we get children to serve. Some day, maybe they want to stand up and out from the crowd. Before the minute of silence, I suggest the organizers dedicate the time to honor those Americans, here or abroad, who fought with weapons or words. The choice should be respectful, meaningful, and educational, not jingoistic. “Tonight, a minute of silence preceding the singing of the national anthem will be to remember the courageous Marines who served and died at Belleau Wood, Chosin Reservoir and Guadalcanal.” Every American ought to know these places. Yes, every. “Tonight’s moment of silence is dedicated to those who died in the continuing struggle for Civll Rights in this country, seeking justice under the law.” Some in the South might object; the African-American players they idolize would not. Then, we can sing the national anthem with meaning, proud of who we are as a people. I don’t care what we pick, so long as it is American. Controversial? Use judgment. Perhaps a young boy will Google “Guadalcanal” and learn about Henderson Field, the Sullivan Brothers, “The Slot,” and Ironbottom Sound. Or remember another Philadelphia, in a southern state, that I’ve never forgotten. 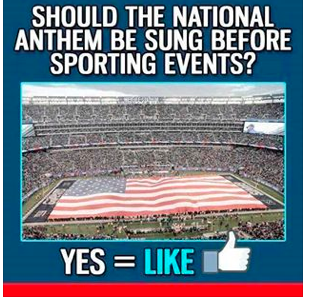 Click yes if you think that teaching Americans at sporting events what this country stands for is a good idea. Might even be a step towards getting people to serve her and bring us together again. This entry was posted on March 13, 2014 at 17:02 and is filed under GENERAL STUFF, MY WRITING. You can follow any responses to this entry through the RSS 2.0 feed. You can leave a response, or trackback from your own site.